It is advantageous for the pro-West faction then, that King Mohammed VI of Morocco has become one of the most influential statesmen in African politics. The King maintains a strong relationship with his counterparts in the US and the EU, based on mutual respect and economic links, and is fast extending an equally friendly hand to Mali and other isolated, underdeveloped African nations. Over the past two weeks Mohammed VI has shown impressive diplomacy and business acumen during a tour of the sub-Saharan countries of Mali, Guinea, Gabon and the Côte d’Ivoire. His carefully cultivated relationship with Ibrahim Boubacar Keïta, the Prime Minister of Mali, laid the foundations for 18 bilateral agreements signed by the two countries during the King’s state visit, covering areas in finance, energy and national defense. With hindsight, the success of Moroccan diplomacy in Mali was to set a trend for the remainder of King’s tour. In the Côte d’Ivoire warm words of welcome were extended in an address by President Alassane Dramane Ouattara, which included an expression of support for Morroco’s preferred policy of autonomy in relation to the Western Sahara. At the presidential palace in Abdijan, Ouattara and Mohammed VI presided over the signing of six bilateral agreements in the areas of aquaculture, tourism and civilian protection. A joint communiqué later released highlighted the potential for further economic cooperation and trade between the two countries, with the aim of expanding diplomatic and, most importantly, economic relations. In a speech in front of over 500 business delegates from Morocco and the Côte d’Ivoire, HM King Mohammed VI openly emphasized the necessity for economic cooperation in today’s climate of global interdependency, "Diplomacy used to serve the strengthening of political relations. Nowadays, the economic dimension comes first, and it forms the basis of diplomatic relations." In Guinea, regal tapestries and jovial conversation were the backdrop to the consolidation of a strong economic partnership. The support of Guinea-Conakry provides Morocco with a strategic entry-point into the ECOWAS and UEMOA markets of West Africa—two markets bustling with foreign investment thanks largely to the local abundance of mineral resources. At the opening of the Morocco-Guinea Economic Forum, King Mohammed VI reiterated the importance of close ties between their two countries, and the mutual economic benefits that should arise henceforth. Over 20 agreements were signed across the fields of transport, energy, water, agriculture, industry and taxation. Morocco is now a privileged partner in Guinea’s economic development, as indicated by the rise in the number of Moroccan banks, including the Attijariwafa Bank Group, that have recently opened up offices in the region. 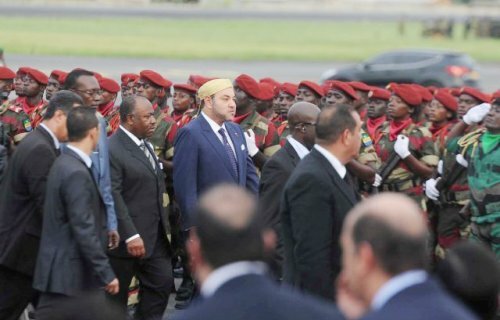 Further southwards in the city of Libreville, Mohammed VI met with the President of Gabon, Ali Bongo Ondimba, for what was the last state visit on his tour. Two days after the two countries met in an international friendly match of football, the King and the President signed a $2.3 billion joint-venture deal for the construction of fertilizer factories and the development of Gabon’s agriculture industry. The deal, a result of longstanding relations between Morocco and Gabon, is to construct two fertilizer factories in both countries that will expand the industries of Moroccan phosphates and Gabonese natural gas. Morocco’s Trade Minister Moulay Hafid Alamy stated that the estimated output of Morocco’s phosphate factories will be approximately two million tons by the year 2018, all of which is destined for the developing sub-Saharan market. A plant to be constructed in Gabon will produce natural gas from ammonia. The deal is expected to generate at least 5,000 new jobs, and will surely have been the ideal closing to a remarkably productive tour of Africa south of the Sahara for King Mohammed VI. As international relations continue to be dictated by the divisive west-east axis, the vulnerable economies of many African countries seek a confident and strong example such as that currently being shown by Morocco and the leadership of HM King Mohammed VI.